Service review for efficiency savings. The aim of the project was to conduct an in-depth review of the service and its operations. Undertook a full service review which included running process development workshops and focus groups culminating in a draft report of recommendations on service improvements. 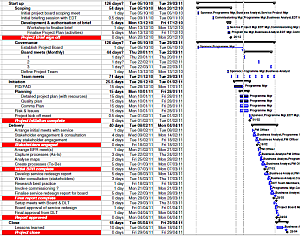 The following diagram provides a snapshot of the plan of action for the review. Engagement and contribution from the EDT to the outcomes of the review including the wider stakeholder group. Report of findings where improvements could be made. The core processes were mapped and efficiencies identified – where any duplication and/or process waste removed. Understanding of what is necessary for a fit for purpose service.